Last Thursday I was interviewed by Nick Coffer for his show on BBC Three Counties Radio. I’ve done one radio interview before for Fun Kids Radio, but that was pre-recorded. I was a little shocked after agreeing to the Three Counties interview to realise it was going to be broadcast live and be up to fifteen minutes long! …Pink Rabbit was chilled out about the whole thing. If you listened right to the end of the interview, you would have heard me talk about an exciting team-up with Fabio’s Gelato in my home town of Hitchin, Hertfordshire. 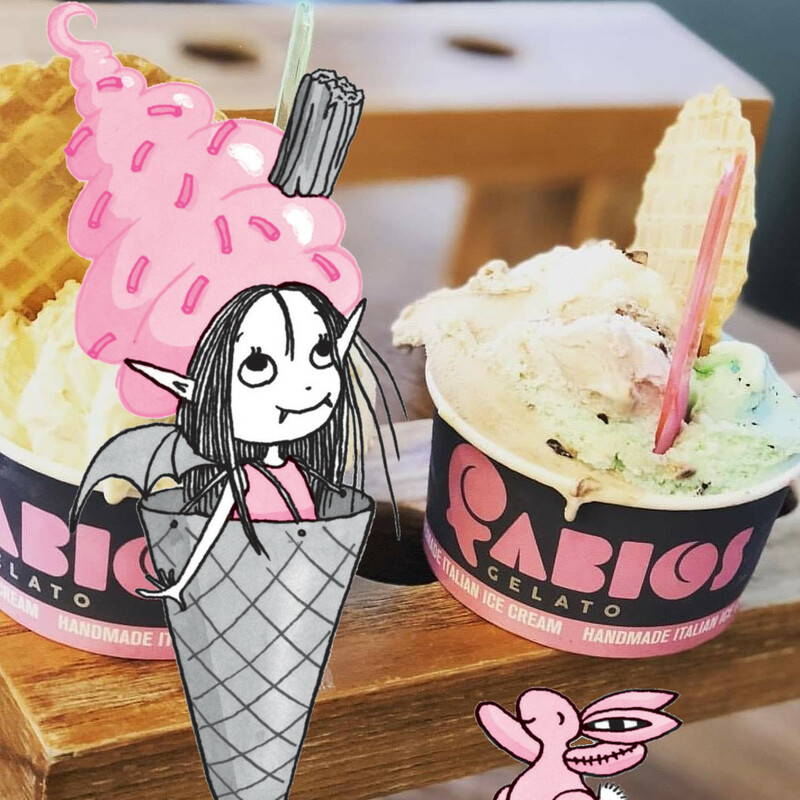 Just for the weekend after Halloween (3rd-4th November) Fabio’s will be selling limited edition pink-and-black Isadora Moon gelato. We’ll be announcing more details, including flavours, closer to the time. Keep an eye on both my Facebook page and Fabio’s Facebook page. Also, a special shout-out to my friend Catherine who came up with the idea for this collaboration in the first place. Check out her book blog here. Look out for limited edition Isadora Moon gelato at Fabio’s in Hitchin on the 3rd-4th November. Saturday was the second annual Hitchin Children’s Book Festival, and this year was even bigger and better than the first time around. While Danny and Sam, who organise the festival, only made 60 tickets available last year as a kind of trial run, this year there were 150, which were pretty much sold out by the end of the day! Some of the Hitchin Children’s Book Festival 2018 Team (left to right): Antonio (Artist & Facepainter), James Mayhew, me, Danny Pearson (organiser and Beano writer), Martin Impey, Sam Mason (organiser and British Schools Museum curator). There were also lots of volunteers who helped out! It was lovely to see my old tutor James Mayhew again, and to finally get to see one of his live performances. It was also really nice to meet Martin Impey, whose wonderful illustrations celebrate and commemorate the sacrifices of ordinary people during the First World War. Naturally Celestine now has a couple more signed books for her collection, and a signed poster from James for her wall. Celestine has a lovely new James Mayhew poster for her room. The festival got a piece in our local paper, The Comet, which you can read here. You can also read my blog post about last year’s Hitchin Children’s Book Festival. Hopefully next year’s festival will be just as good, if not even better! I’m addicted to making tiny woollen hats! Here’s one of my finished miniature bobble hats. Pink Rabbit had never been to London before. Pink Rabbit wondered why people make such a fuss about London Underground being crowded. I get to feel like a miniature person holding this giant book cover. After we’d met all the lovely staff and had a quick drink, it was time to start the window display. It was a big window, and I’m not used to drawing on such a large scale. Henry had to help our with some of the colouring, but we got there in the end! It was a bit strange at first when people outside kept stopping to watch what I was doing. Here’s the finished display with all the books. As well as doing the window display, we also ran an Isadora Moon party. The children got to make Isadora Moon Winter Mini Books, play a couple of quizzes and practise drawing some of the Isadora Moon characters. There were loads of drawings by illustrators I recognised on Tales on Moon Lane’s illustrator wall. My contribution was a little Pink Rabbit. My next couple of weeks are a bit quieter, but I’ve got plenty coming up between now and Christmas. You can keep up with my latest events on my events page and through Facebook. I’m always adding more, so check back frequently. You can also keep up to date with what I’m up to by subscribing to my newsletter. I’ve still got Pink Rabbit Enamel Pins in stock, and you can order these in my shop. Isadora Moon Makes Winter Magic is available now from Amazon, Waterstones and all good book shops. If you’re looking for free Isadora Moon crafts and activities for home or school, check out my resources page. And if you’d like to book me for a school visit this term, check out my schools page.